Juan Pierre gets in quite a workout during a television shoot in Glendale during spring training. Part of the simple joy of spring training is enjoying the laid back atmosphere of camp while witnessing the array of unusual projects that are planned during this time. It is so much easier to accomplish many of these while in Arizona because once the regular season starts and the intensity level goes up more than a few notches, the guys have other priorities in mind. Over the past few seasons, I’ve had fun covering the “behind the scenes” aspect of our television commercials for the upcoming season, and this year was no different. Jake Peavy, Mark Buehrle, A.J. Pierzynski and Juan Pierre are to be this year’s featured stars. A.J. 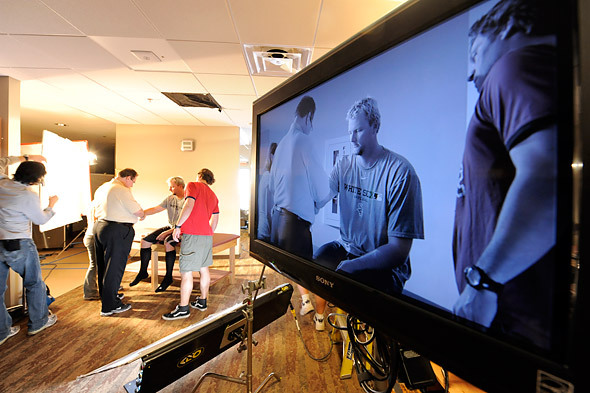 Pierzynksi prepares for another take during filming. 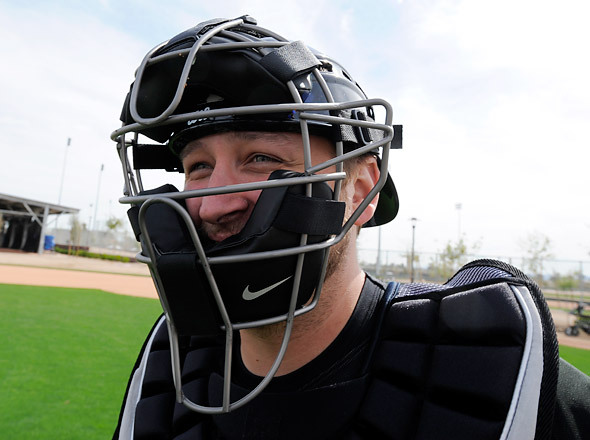 For starters, it was kind of fun to see Mark Buehrle becoming Jake Peavy’s battery mate as he plays an unfamiliar role in an upcoming White Sox commercial. Or Juan Pierre putting in an incredible workout while filming his spot. I have a new found respect for the athletic condition that guys like Juan are in… amazing! A.J. prepares for yet another take. The mood during all the shoots was fun, and the results I’m sure will be amazing. It’s cool to be behind the scenes watching (or in my case documenting) what goes into any shoot, whether it’s video or stills. You know what else is amazing? The size of the production crew necessary to make everything happen. Beyond the director, producer and camera man you’ve got an army of lighting techs, prop techs, make-up artists, sound engineers, caterer, even staff tracking the hours of the production crew. The whole scene is truly something to witness! A.J. Pierzynski sits in "the whirlpool" while "on the road" in Baltimore. I have to admit I’m somewhat jealous. I’ve often worked without the trusty help from an assistant, much less having a make-up artist on hand (I have, but not often) or a caterer. Caterer? You know, having a caterer available on location might be fun once in awhile. This entry was posted on Wednesday, March 31st, 2010 at 9:47 AM	and is filed under Chicago White Sox. You can follow any responses to this entry through the RSS 2.0 feed.